Edie was Karen’s first failed attempt at fostering. She had been bounced from her home at seven years old. Her name was Shadow. Her coat was course, she had a voracious hunger for cats and she hated, hated more than anything to ride in the car. However, she found Karen’s couch and worked her magic. She was such a funny girl. We fed the older ladies together and after every meal when we gathered the bowls, there would be water in one of them. Curious we thought. One evening, I sat behind the wall and watched. And sure enough, Edie finished her meal and promptly peed in the bowl. We never have seen that since. Karen renamed her after one of her favorite singers, Edith Piaf. Edie was also the choir director. Every night and every morning, she would begin with a low trill in her voice. If nobody joined her, the trill would get louder and louder until the entire pack was rooing with her. Her trill was beautiful, I so looked forward to it. We’ve never had another greyhound since that could trill like Edie. 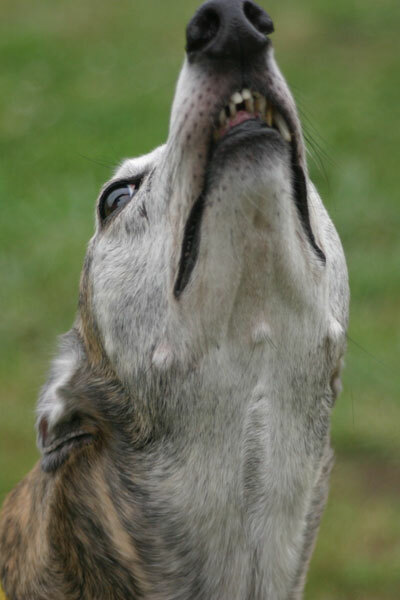 Rooing is a wonderful greyhound thing. Together they all join in song, probably more like a howling. They really aren’t discerning about when they roo. They like mid-day, 3 am, midnight… just whenever the spirit moves them.